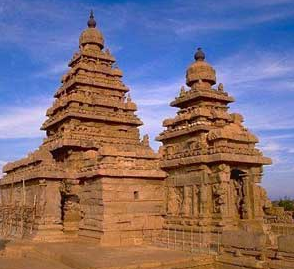 Some of the earliest Hindu religious structures have not survived the ravages of time and man. But as temples began to be constructed of more durable materials like brick and stone, their longevity increased and we are now not only able to understand how our ancestors worshipped their gods but are also able to view their skill in shaping these religious structures. 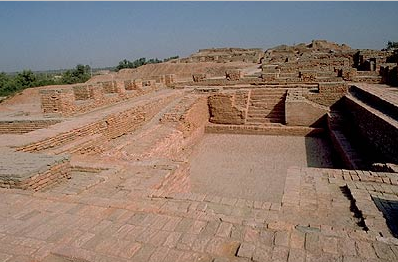 A public water tank of the Indus Valley Civilization, the Great Bath is postulated to be part of a religious structure, presumably Hindu. Although there is no concrete evidence for any of these suppositions, it is probable that the Great Bath could be a precursor to temple tanks where devotees ritually purify themselves before they enter the sanctified premises. Built by the Pallava rulers between the 7th and 9th centuries CE, the rock cut, monolithic and structural temples of Mamallapuram (modern Mahabalipuram), the port city of the Pallavas, including the famous Shore Temple made of dressed stone, form one of the earliest known existing Hindu religious structures in India. 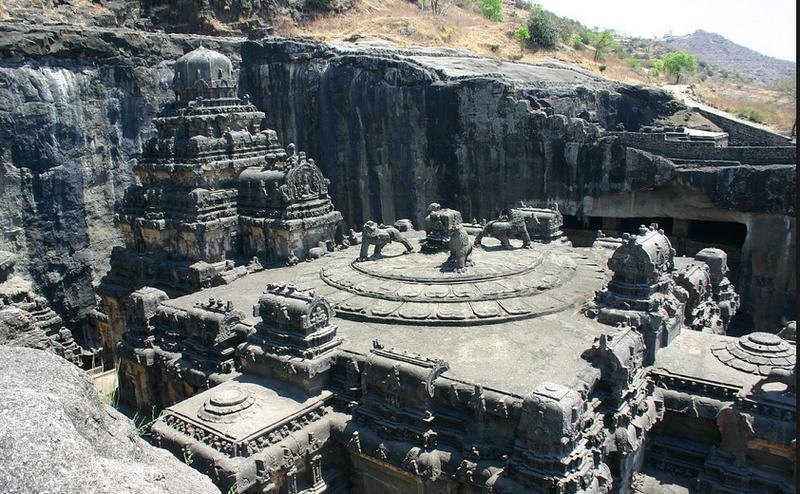 Carved out of the mountain face, the Ellora “cave” complex actually consist of both temples and monasteries belonging to Hindu, Buddhist and Jain faiths (with some of the Hindu “caves” being the earliest) constructed between the 6th and the 9th centuries CE by the Kalachuri, Chalukya and Rashtrakuta dynasties. 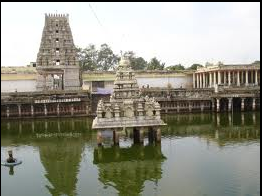 Kanchipuram, the former capital of the Pallavas, the “City of Thousand Temples” houses numerous ancient Hindu temples that make it an important pilgrimage point for both Shaivites and Vaishnavaites, the two major Hindu denominations today. 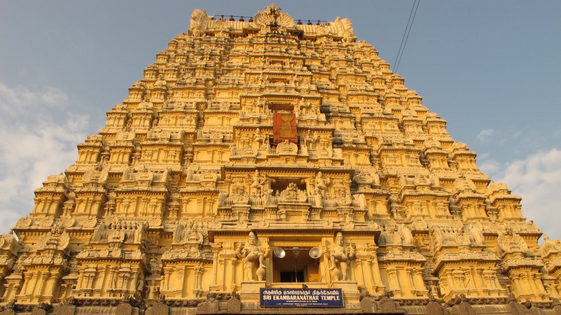 The Varadharaja Perumal, the Ekambareswarar and the Kamakshi Amman Temples here are more than a millenium old. 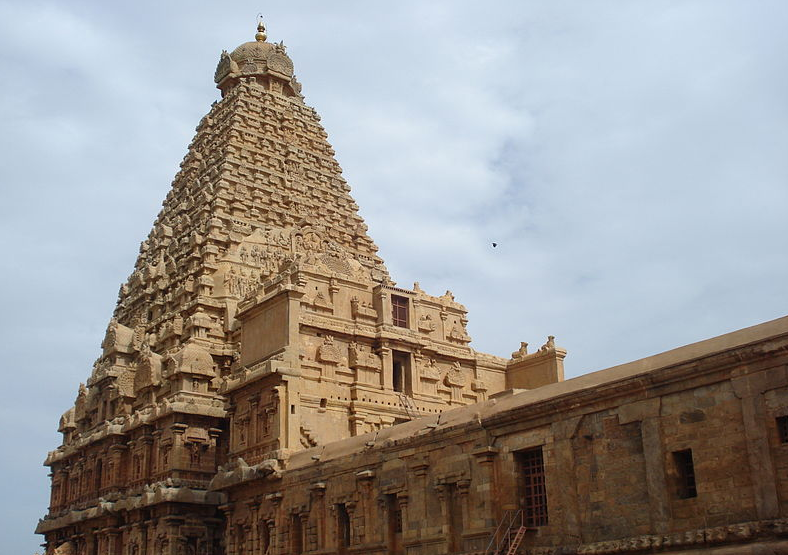 Built a thousand years ago, the Brihadeeswara Temple at Tanjavur, built by the Emperor Raja Raja Chola was historic in many respects. Dedicated to Lord Shiva, this temple was the first temple in India built entirely of granite, one of the hardest stones in the world, in quantities sufficient to fill the Great Pyramid of Giza. Large enough to hold 10 Taj Mahals, the Brihadeeswara Temple was 10 times taller than any other building in India at that time and it’s capstone consists of two granite stones of 40 tons each, raised 216 feet in the air. A religious and engineering marvel. Indian temples and Hindu Motifs are not confined to the geographical boundaries of India alone; regular trade and political interaction led to the spreading of indian influence across the sub continent. Angkor Wat* is probaly the worlds most famous Hindu edifice and the largest religious structure of its kind. The temple is a classic case of Indian Hindu sensibility being combined with local regional aesthetics– Khmer temple architecture with Dravidian temple style. The temple’s dedication to Vishu can be made out in the temple’s departure from the conventional orientation; it faces west while all others conventionally face east. * UNESCO World Heritage sites.